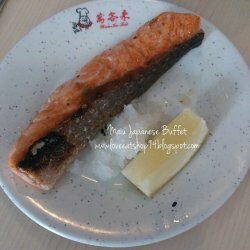 Maiu is an ALA CARTE BUFFET style in Japanese cuisine. It simply means that we can order all the ala carte dishes which usually can be seen in normal Japanese restaurant, but at here it is UNLIMITED! It is located at Sri Petaling and near to the workshops. We parked the car near Baskin Robin (another street from Maiu) because the parking slots in front of Maiu were fully occupied. It is usually fully seats during weekdays or weekends. So, we booked few days before visited here. The food is served upon ordered. 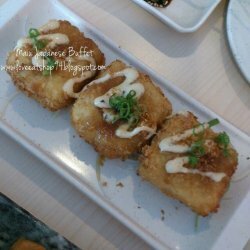 Tofu is deep fried and served with mayonnaise and sprinkle of chopped onion. The softness of the tofu was just right and a little sweet. Here it is the UNLIMITED free flow of SASHIMI! I personality think that this salmon sashimi is much better than the one I had in Jogoya. The salmon was thick and still fresh when served. The salmon cooked was tender and fresh. I applied some lemon on top of the fish which make it more delicious. 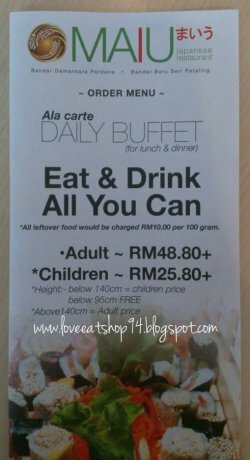 It’s definitely an affordable place to dine-in for unlimited ala carte style. 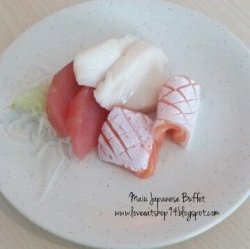 Apart from the buffet, they also do serve bento and other menu set in normal price.